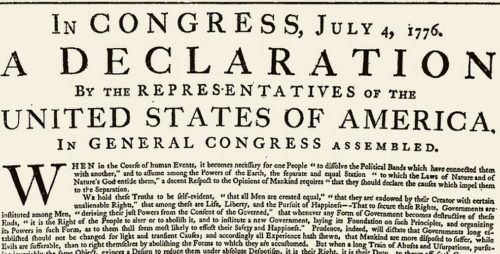 Every Independence Day for the past 29 years, National Public Radio has broadcast a reading of the Declaration of Independence. This year, when NPR tweeted out the historic document line by line, things got weird. While the decontextualized tweets no doubt caused a number of Twitter users to scratch their heads until they put two and two together, some Trump supporters took the tweets as an attack on Donald Trump. It is SO telling that @npr is tweeting our Declaration Independence… and Trump supporters think it's an anti-Trump tirade. One Trump supporter didn’t mince words. Another Twitter user with an American flag emoji next to their name said he thought the tweets foretold a dismal future for… NPR. Mills wasn’t the only “patriot” who seemed unfamiliar with the nation’s founding document. Pls define who….are u referring to the Saudi prince? Some went so far as to accuse NPR of trying to inspire an anti-Trump revolution. But, to their credit, D.G. Davies was willing to stand corrected. Dave, what better lesson to learn than at the hands of your countrymen?